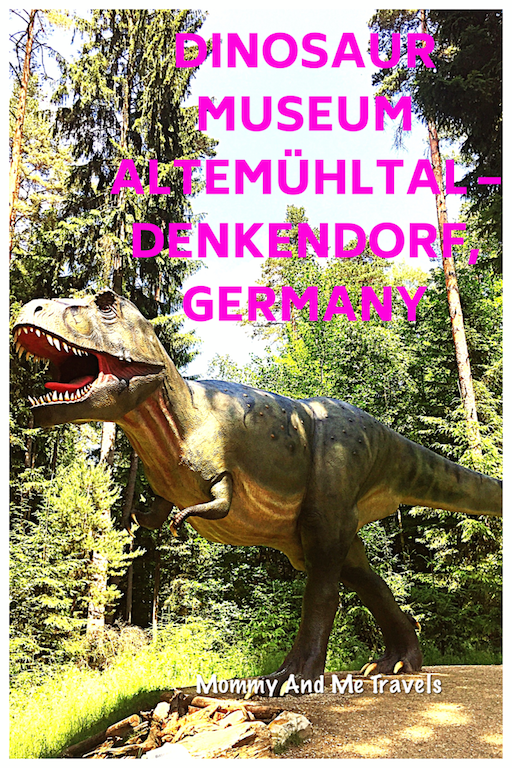 Mommy And Me Travels had the pleasure of exploring the Dinosaur Museum Altemuhltal located in Denkendorf, Germany which is a must visit family location if your kids are into dinosaurs. 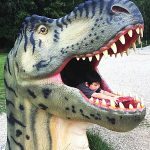 All you will hear is dinosaurs, dinosaurs, dinosaurs! 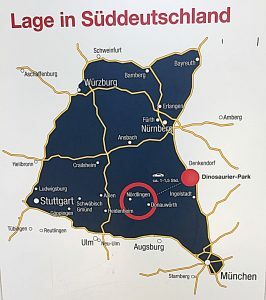 This museum is located within an easy day trip from many large cities in Germany, like Stuttgart and Munich. The park is open 365 days a year, including sundays and holidays. The entrance price is a little steeper than most similar parks around Germany. When we went it was 9,50€ for kids 4-14 and 19,50€ for adults but parking was free and plenty of spaces available. You can spend the whole day here or just a couple of hours. 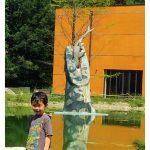 It all depends on what you choose to do and how much time you spend at each of the many dinosaur exhibits and activities. Click here for the Dinosaur Museaum Altemuhltal website. This will help you ensure that you have the most up-to-date information before your trip. can run through the path/trees and find the hidden dinosaurs. 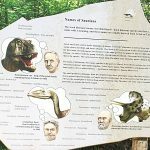 The signs for each exhibit are in both German and English making it easy to explain to your child about the evolution as they explore. 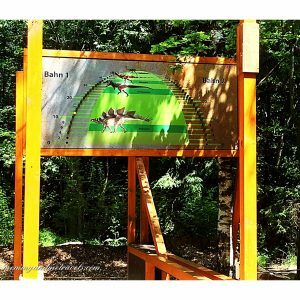 The trail is well marked and an easy hiking path. My 5 year old walked the whole thing on his own and I was able to easily push my youngest in a stroller. Along the way there were neat activities for the children to play in. Like this 50 yard dash event. See how fast your kids are. You could even have two people race against each other in lanes next to each other. There are 2 places to eat at this location. 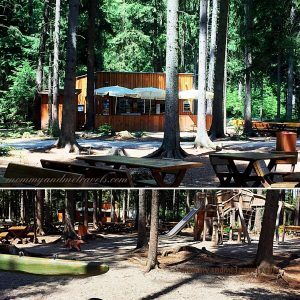 There is a bier garden halfway through the hike and also a restaurant by a lake at the beginning/end of the trail. We chose to stop at the bier garden to have a snack and allow the kids to run and play at the park area there. This break was a nice way to split up the hike and keep my boys interested in continuing to learn as we walked the last half of the trail. 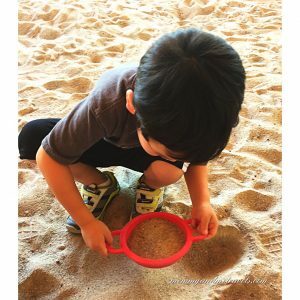 fossils and the sorting through sand to find gems and shark teeth. 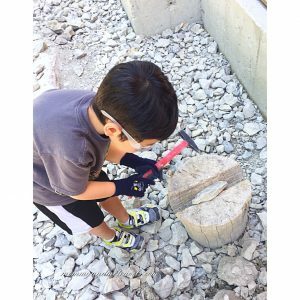 While beating rocks with hammers was fun for my son, I did not think this activity was worth the extra money for how young my sons are. An older child would probably get more out of this. My son required a lot of assistance and got bored of it after about 8 mins. The digging in sand was more of my kids speed. 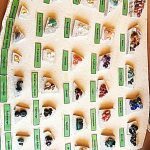 They loved finding all of the colorful gems and putting them into their pouches. I would spend the extra few euro on this activity again. 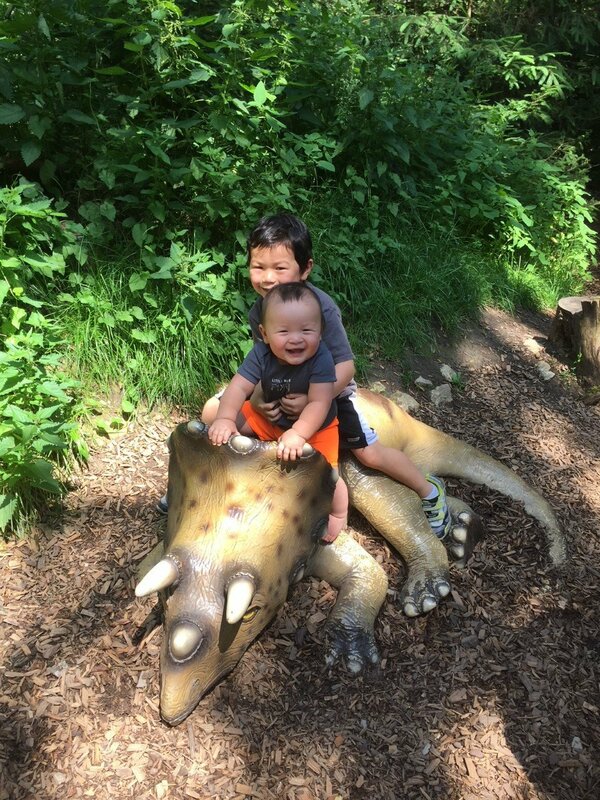 At the end of our adventure of hiking, splitting stones, and digging in the sand we sat by the lake and enjoyed a cool refreshing treat which allowed for the boys to play at the park and get out their last burst of energy while mommy relaxed. All in all this was a fun day of exploring and if we are in the area we would stop again. 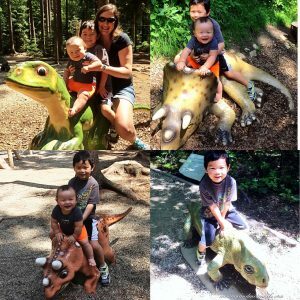 Looking for more fun dinosaur activities? 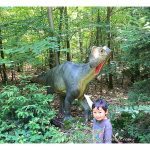 Check out our visit to the Dinosaur Park in Kaiserslautern, Germany.